It's not too far-fetched to say that if Martin Luther King Jr. were around today and had to give a three-letter response to the programming on BET, it would be something along the lines of "SMH." We'll never know for sure what the civil rights icon would have made of 106 & Park, but this fall we'll see his son's vision for what is being billed as the first broadcast network devoted to an African-American audience. 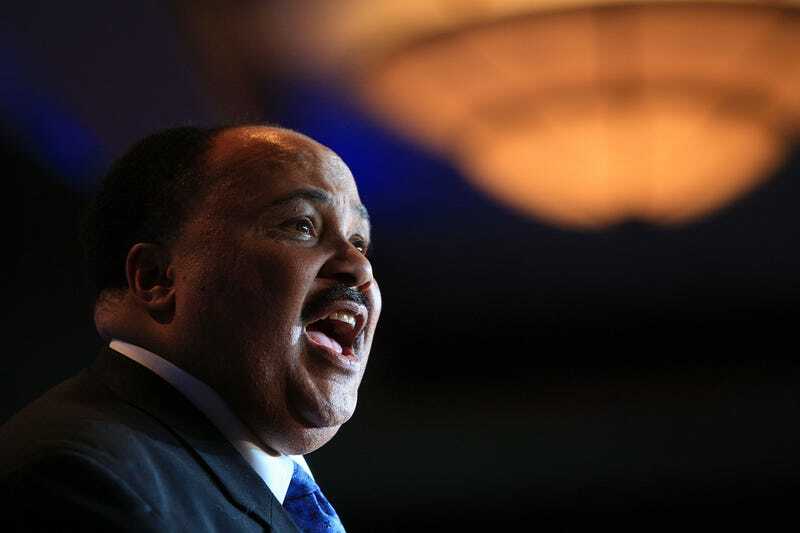 On the 43rd anniversary of his father's death, Martin Luther King III announced the upcoming launch of Bounce TV. The civil rights legend's son is a founder and has a seat on the board of directors. A press release says that the network will target African Americans primarily between the ages of 25 and 54 with a programming mix of theatrical motion pictures, live sporting events, documentaries, specials, inspirational faith-based programs, off-net series, original programming and more. In preparation for the launch, the network has struck a deal with NBC Universal Domestic Television Distribution for nearly 200 titles, including the 2004 Jamie Foxx movie Ray and the Denzel Washington film The Hurricane, as well as agreements with Sony Pictures Entertainment and other content providers. King said of the venture, "My father envisioned the day that African Americans would play major roles in entertainment within ownership, not just serve as entertainers on the stage or in front of the cameras. That's what makes this even more exciting to me as we embark on this new endeavor of an independently owned and operated broadcast television network featuring African Americans." African-American ownership is great, but when your dad is MLK, the bar for "exciting" is set a little higher. We'll be watching, and hoping that a network that reflects the diversity and depth of the black experience is more than just a dream. Read more at the Wrap. In other news: White House Calculator Promotes Tax-Cut Savings. In other news: David M. French Dies at 86.